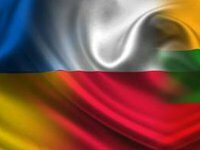 The Coordination Group on operation, personnel training, and use of the Lithuanian-Polish-Ukrainian brigade LitPolUkrBrig has held a working meeting in Lublin in order to discuss the use of budget funds and deployment of staff and battalions in a series of international exercises. Exercises under discussion included Anaconda 2016, Triple Brave 2016, and Common Challenge 2017, the press service of Ukraine's Defense Ministry reported. The Group meets twice a year, said head of Ukrainian delegation, First Deputy Commander of High Mobility Airborne Brigade of Ukraine's Armed Forces Yuriy Sodol. He said at such meetings the parties discuss management, budget control, and training of LitPolUkrBrig, giving further direction for development to the multinational brigade. As reported earlier, in July 2015 Ukrainian, Lithuanian, and Polish defense ministry chiefs signed an agreement on the operation of the joint military unit - multinational brigade LitPolUkrBrig. An opening ceremony of LitPolUkrBrig headquarters was held in Lublin (Poland) on January 25, 2016.